Pet Dog Private Obedience Training by DogGone Right! Inc.
Do you work evenings or head to the cottage or skiing for the weekends and can't make it to a weekly class? Then, our Private Obedience Training is for you. This program is designed for people whose schedules don't fit a conventional weekly class format or people who prefer one-on-one instruction. 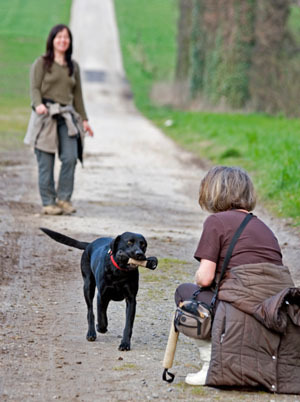 You can come to our training centre or we can come to your home to work with you and your dog on a more personal level. We will show you how to better communicate with your dog and teach them such skills as sit, down, stand, walking on a loose leash, and stay. We are delighted to work with a multi-dog household at the same session for an additional 20% charge per additional dog. For more information on this service, please contact us to discuss your specific case. Price per session: $150.00+HST; extra charges may apply for travel. Each session will last between 1 hour and 1.5 hours. *Prices subject to change without notice. Contact us to confirm pricing.